I graduated from Evergreen Montessori House (EMH) over 20 years ago, but the lessons I learned during my time there still impact my daily life. During my four years at EMH, Ms. Gargi supplied me with the tools and guidance to choose my own course of learning; nothing was out of my reach. By directing my own course of learning, I floated into the distant galaxies of the solar system and traveled to the Amazon rainforest, where I befriended sloths and swam with pink river dolphins. Math was not an abstract concept. I could see how each number got bigger as I counted my way to one hundred (see post “The Montessori Method and Math”). 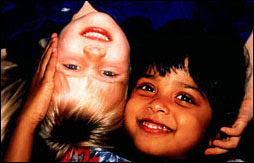 Nothing has changed at Evergreen Montessori House; students are still empowered to take control of their education. My experience at Evergreen Montessori House created a desire in me to learn and investigate the world around me. We never truly stop learning and never stop using our imagination; even today I explore the universe and swim with dolphins. My time at Evergreen Montessori House helped establish a firm foundation upon which I continue to build my library of knowledge. Very Informative blog.Keep the good work going.